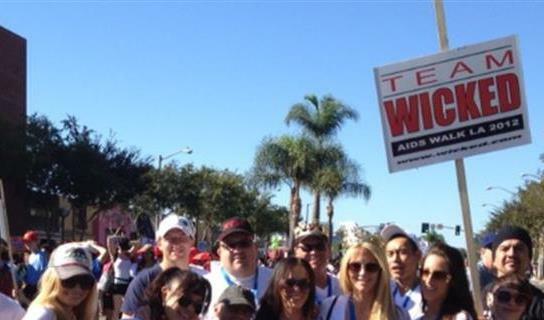 Once again, #TEAMWICKED is participating in this year’s AIDS Walk Los Angeles, a 10K fundraising walk to fight the epidemic. To date, we have raised over $100,000! We are forever thankful to everyone who has walked with us, donated, and supported us this far. Please join us, signal boost or donate today. Every dollar we raise helps APLA Health stop new infections and support people living with HIV/AIDS. Thank you for consistently showing us through your actions that we can always do more and BE better. You are a true inspiration and I am damn proud to support your cause. Matching the donations from Miron, Andrew, and Dee. Thank you for contributing and for your generosity to such a worthy cause. You're kind and wonderful. Looking forward to walking with you and the Wicked Team again this year! You are as beautiful on the inside as you are on the outside. Remembering our walk last year still makes me smile! Love me some jd & brad! Keep up the good fight. Thanks #TeamWicked for always raising money for this cause. Love you Jessica!! Fallen is my favorite videos well really looking forward to receiving the new one!!! Always happy to help when I can jessica. Thanks for doing this. I really appreciate your work. hope you meet your goal?? Thank you for walking, sorry I can't be there in person to support you. Hi Jessica and team! Sadly I'll be in trial this year, so I won't be able to walk with you. Hope to see you all next year, and best of luck raising money! From: AlaninSoFlo Love you Ms.Drake and all you do for this event. To September Reign, I know it takes a village to make a difference and every bit helps. A blessing I know it is to give something back. AIDS-related deaths have been reduced by more than 51% since the peak in 2004. In 2017, 940 000 [670 000–1.3 million] people died from AIDS-related illnesses worldwide, compared to 1.9 million [1.4 million–2.7 million] in 2004 and 1.4 million [1 million–2 million] in 2010. You go girl!!! For my favorite walker. Always there for you. In honour of your trouble. From Ol' Doc Roberts - Diablo City, AZ Territory - Thanks for all you do, Beautiful.